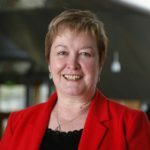 Highlands & Islands Regional MSP Rhoda Grant has ascertained by means of an FOI that the MV Loch Seaforth, which sails between Stornoway and Ullapool, has had to cancel 68 sailings due to adverse weather between July and December last year. Rhoda Grant said ” After such a huge investment having being spent on this vessel, I am somewhat concerned to learn that 68 sailings were cancelled due to adverse weather conditions. Yes, I appreciate that this is a call that the Master or Captain of the vessel will make, taking cognisance of all other surrounding factors, but this number seems to me to be particularly high for a new vessel over a six month period and makes me wonder if the vessel is actually fit for purpose. ” Of course they get pretty severe weather out in the Minch, but is it so bad that so many sailings have to be cancelled? I would have thought that these factors would have been considered when they designed the build.